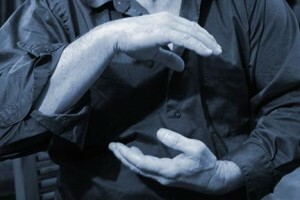 Not everyone knows it but there is often a lot of “standing still” in the practice of Qigong. That’s right, you just stand there without moving and, as you might guess, this can be difficult for people. Here’s a thought on one of the reasons for our antsy behavior. We stand and we wiggle. Standing still is a skill which some people make into a career. Posh Los Vegas “eateries” draw floridly faced and dressed patrons by studding their halls with living statues who stand there with frozen eyelids while others eat. These are both models of both quirky decadence and the sad human fact that a little nearby torture wets the appetite. This is nothing like being motionless for free. To hold a pose for any length of time is a difficult adventure. September chills seems to alternate with spring ebullience coursing through our bodies. We want desperately to shift, or droop, to re arrange. And even if we give in to our needs we soon find that none of this helps you stand one jot stiller. There are many reasons for the difficulty of letting the engine or our fates idle for a while, but I want to consider one particularly prickly point. There are many causes, as we have said, for standing still to be so arduous but the one I address here deals with something so basic to our natures that we rarely perceive it. It is not on the “A” list of our excuses. Something resides in each of us and knows things about us which we can barely accept or grasp. It knows, for instance, which parts of our natures live in dark corners and which do not. Don’t for a second associate this with right or wrong or any other moral judgement because it is more than mere morality and that is precisely why it is such a trouble. This part of us knows that we have a fundamental nature which most modern people consider to be a soul, or a self or a personality. Character you might say. Most of us are familiar with this type of thing, it is evident as people go about psychoanalyzing everything, seeking causes and effects rooted, always despite all the disguises, in the personality of the subject. The whole world is people by ego and attitudes. We think of this character thing as our property, our personality, but it is also our owner and we are its property. We may pretend all sorts of other things, but basically this socio psycho personal complex is what we think we are really like. We think we know what’s troubling us, what we like, how we are trapped in limited options due to our past training, our fears and, yes sometimes, how we are even superior and gifted for the same reasons. We have been conditioned to see ourselves as survivors in the personality game. We may overcome gigantic obstacles and triumph over all adversity due to our innate strengths but, ultimately, whether the story ends with us being heroes or cowards, whether this bend in the road or that awaits for us with danger or reward; we are essentially in a movie, a book, a story: an exploration of our glorious personality and essential individual freedom. Yet stillness reveals an altogether different aspect of our natures. The ancient idea of consciousness does not consider personality fundamental, more “added on” one might say. We are who we are but there is something more basic than our personalities. More foundational. Of course, you might think, after all we are human. But our idea of ourselves as humans is little more than our alienated, completely unconnected idea of ourselves as bodies in space. Just as we reduce the components of a fine meal to “carbs” and “vegies”, we think of our humanity as somehow plain and incidental without the decorative addition of our wonderful and enthralling personalities. But actually quite the opposite of the common view is the correct one. Our true selves, far more than our characters, enchant and surprise us with our dreams, our creative play, our dazzling and sometimes transcendental delights. And if this is true, you ask, why would this part scare and annoy us? Why would it be hidden in the dark waiting to step out only when we are trying so hard to hold ourselves steady? Why would we not welcome it? Actually this is the easiest part to explain. The answer is simple. If our fundamental or pure natures were enough for us to live then the remainder would be surplus, wouldn’t it? Our jobs, much of our relationships, many of our goals and motives would ring hollow compared to the silent music inside our frames. Admit it. Such an idea can make you squirm a little even when you are not trying to be still. Think how much more power such knowledge has when you are not even chasing cobwebs or remembering that shopping list we call our lives.